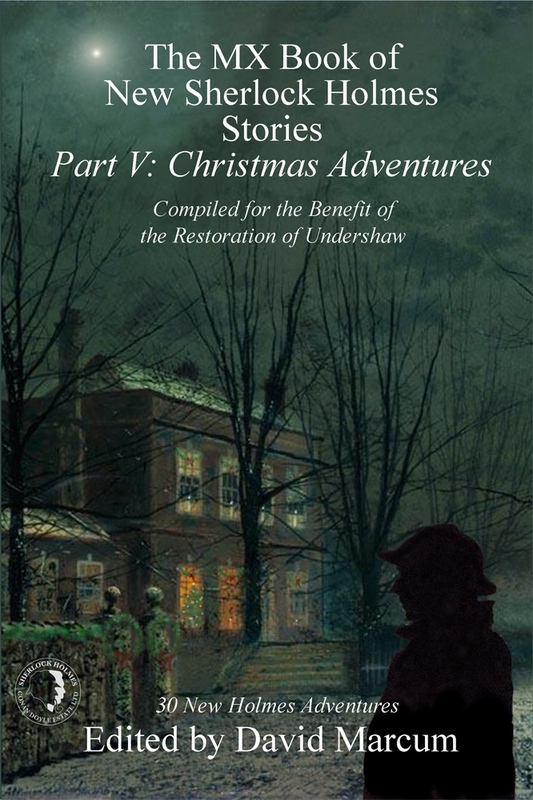 As we progress through the holidays I’m still reading Holmes, in this case the MX Book of New Sherlock Holmes Stories Part V: Christmas Adventures as mentioned last week. I’m over halfway through the 528 page anthology and liking it very much. 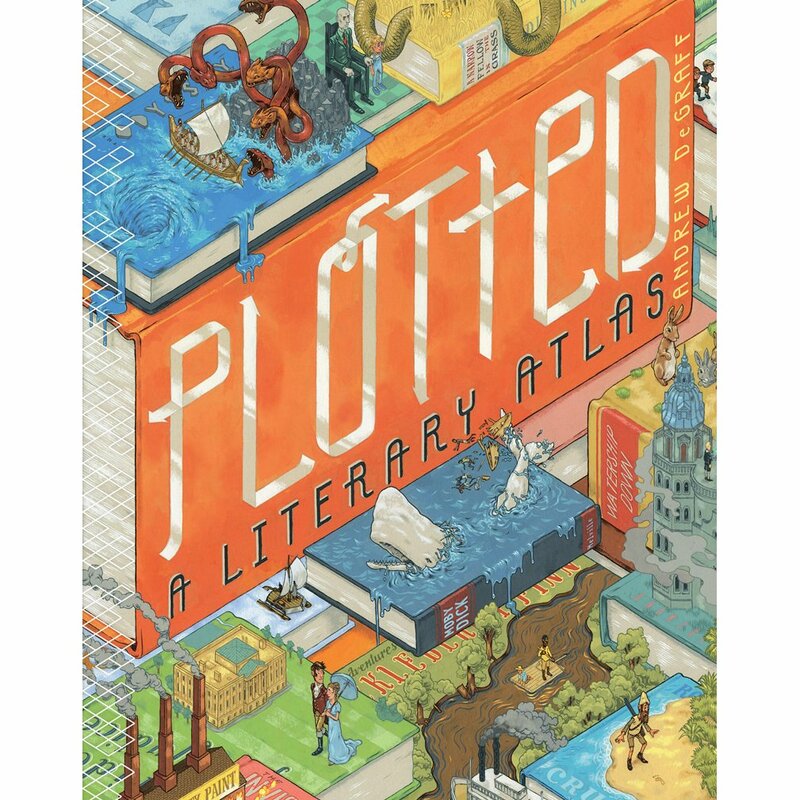 Also, from the library came Plotted, A Literary Atlas. It’s a collection of maps of various places, all tied to literature, naturally. The cover will give you an idea of the contents. I went through it in half an hour and was very unimpressed. So, I’m reading Holmes short stories and doing the seasonal stuff (the tree is up, lights on, partly decorated). Barbara finished Henning Mankell’s One Step Behind, and is starting a Reacher novel, Personal by Lee Child. Read City of Saints by Andrew Hunt. His first of three novels featuring Art Overson. I already read the 3rd one. Mysteries that take place in Salt Lake City during the 30’s. I’ve enjoyed both. I have the 2nd on my TBR pile. Also read the new Robert Charles Wilson, Last Year. I enjoyed it. A time travel novel. Also read Brazen by Loren Estleman. The 5th in his Valentino series. This is the weakest in the series. I was a bit disappointed. Also finished Bruce Springsteens autobiography. Loved it. And am just finishing Colin whitehead’s Underground Railroad. Going to be one of my years favorites. A alternative history novel that just won the National Book award. Just starting David Downing’s Potsdam Station. I have to pick up the Wilson book (on your recommendation, Steve) at the library today. Lots of good reading there, Steve. I’m interested in the Wilson too. I’m not getting that much reading done lately, but hope to get back in the groove after the holidays. I started M.R. Carey’s THE GIRL WITH ALL THE GIFTS last night and stayed up waaay too late reading it–I’m blurry-eyed this morning, but really enjoying the book. I don’t know how much more reading I can get done this week–lots of seasonal activities are on the schedule and I haven’t made a dent in Christmas shopping yet. But at least the tree is up and decorated now. Deb, I loved your tree pictures, especially the girls with the bears. I’ll have to check out the Carey, thanks for the tip. Christmas shopping is about done here, but then we send the out of state packages off early, leaving just the two of us. Barbara is gone today with her quilt group, so I’m to hang ornaments and put up a wreath. Plus some more reading. The movie has gotten good advance reviews. I read the first two volumes of Hal Foster’s PRINCE VALIANT, the first from 1937-1938, the second covering 1939-1940. These were full size reprints, harking back to the original full-page newspaper appearances. I spent much longer than I normally would on these two, just admiring Foster’s beautiful and detailed artwork. (The only problem I had was that the young heroes — Valiant and others — all had distinctly feminine faces. A minor quibble, considering the sweeping story line and the painstaking art.) I also spent much longer than normal on my FFB, SISTER WENDY’S ODYSSEY, a look at nearly three dozen paintings (and one sculpture). Sister Wendy’s feelings about each piece led me to examine each painting in much closer detail; an hour’s read took me over a day to finish — time very well spent. The Polar Vortex found its way to the Florida Panhandle this week. No snow of course, but freezing temps — cold enough for people to look at me strangely for wearing shorts. (I’m from New England and that was beach weather for me.) I hope you and Barbara are “weathering” well. The vortex took a break yesterday here but is expected to be back with a vengeance later this week. A friend brought that Prince Valiant book over for me to look at, it’s huge. I’m not enough of a fan of the strip to get it (from the library) myself, but it sure is pretty. Three point type? That’s a book I’d throw at the wall (figuratively, of course). Weather here is drying out, but getting colder. Good thing, because icey conditions lock us in on our steep hill, and I have appointments this week. 27 degrees is okay as long as it’s dry. My online students are taking their FINAL EXAMS today. My classroom students take their FINAL EXAMS tomorrow. Then I’ll have a couple days of correcting and grading and paperwork. My reward for completing all this work to end my 40 year teaching career is to see ROGUE ONE: A STAR WARS STORY on Friday! Then, let the reading binge begin! I am reading DEAR DAUGHTER by Elizabeth Smart (or is it Little). This is after I started seven books in the last three days. None of them felt right. Perhaps nothing will again. I am watching a lot of Netflix though. Especially like GLITCH for those who like a touch of supernatural. It’s Little. I sometimes have the same problem with starting several books but none clicking for me. You’ll find just the right thing soon. We have GLITCH on our list, as soon as we catch up a little. Finished Robert Harris’ COVENANT, about the selection of a pope, and am about to finish Holly Messinger’s THE CURSE OF JACOB TRACY, a weird western. Covenant is an oldie, isn’t it? His newest book is Conclave, about the selection of a pope. He never wrote a book called Covenant. Thanks, Steve. I think I had the 1980 Michener book in mind. Had a rough reading week – a colonoscopy destroyed two days, basically, and we had two concerts. I hope this week is better. I still have ZERO library books (other than one download) but have 2 waiting for me and 2 more in transit. We’ll see, We leave for Florida 5 weeks from yesterday. I did read a couple of books – THE HEAVENS MAY FALL (library; trade paperback original) by Allen Eskens, bringing back characters from his first book. This is more of a trial book as lawyer Boady Sanden and his friend, detective Max Rupert, as the main protagonists, and antagonists. Sanden defends a friend accused of murdering his rich wife, and Rupert is convinced of his guilt. Nice (if not 100% unexpected to the experienced reader) twist at the end. I like the less common Twin Cities setting. The other was the new Crippen & Landru collection edited by Martin Edwards, MOTIVES FOR MURDER: A Celebration of Peter Lovesey on his 80th Birthday by Members of The Detection Club. Lots of good authors and some very good stories, some even with Lovesey characters Sgt. Cribb and Constable Thackeray (and one Holmes & Watson story). Recommended. I downloaded and started the fifth Charlie Muffin book by Brian Freemantle, now that the library has started getting ebooks of the older ones I’d missed. This is MADRIGAL FOR CHARLES MUFFIN, set in Rome. It’s too early to comment on yet. I also downloaded (and will start today) a collection of Howard Waldrop stories after a mention (by Steve, I think) last week. Re: your colonostopy. Thank you for not saying, “Everything came out okay at the end.” The temptation, I’m sure, was enormous. You’re powering through the library books if all you have is 1 ebook. Good job. I have five or six on hold but none ready yet, though I’m “in range” on all of them (2 of 8, 1 of 14, etc) so several may pop up all at once. My sympathies on your colonoscopy, hope it’s a good result. I have two med appointments this week. No joy. Yes, I recommended the Waldrop. Richard, I’m hoping to read couple of Christmas stories this season, though I haven’t decided which ones. I might not be able to finish a novel by December 25. I was home sick with a nasty cold all day Sunday, so with football playing in the background I read through the new Star Wars Rogue One prequel, Catalyst. It was good, looking forward to seeing the movie tomorrow night. Then started on the first of the Lost Fleet series by Jack Campbell, Dauntless. Sorry to hear you were sick, Carl, hope you’re feeling better and back on your feet soon! I have that prequel on a “wish list”, so we’ll see if it shows up on Christmas.